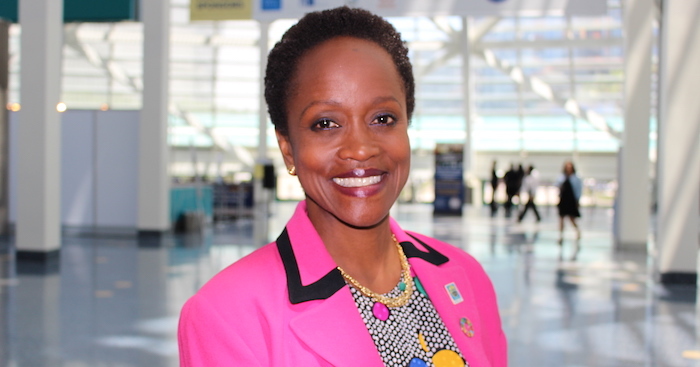 We managed to grab Esther Brimmer at NAFSA’s annual conference in Los Angeles to take stock on her first six months as CEO during very difficult times for US international educators. She also shared her vision for the future of the organisation and what music can make her get up and boogie. The PIE: So, you’re six months in, tell me how it’s going at NAFSA. EB: It has been really exciting. One of the great things is really getting to know people. I started off with our Washington meeting in January, but here at the annual conference I am really getting to know members from across the association, so that is really the highlight, getting to hear directly from members what they care about and seeing members in action. EB: My first annual conference. You know intellectually what the organisation is trying to achieve, that you have members in multiple regions working on multiple issues and that NAFSA has the convening power to bring people together in person and virtually. Just here in the Los Angeles Convention Center, as you walk down the hallways and look in each room and see members working on this issue, on that issue, you physically see NAFSA working, with people from all sorts of places all talking together and that is really cool. The PIE: What do you think is going to be your biggest takeaway from this event? EB: The creativity of the membership. First of all, they are deeply committed to international education with really interesting ideas about what they want to do, both with their careers and with their profession. NAFSAns are curious and so one of the things I want to make sure of is that I think about how we provide activities that help them meet that curiosity and help them think about what issues are important to them. What do they need to know about their careers, what do they need to know about the environment in which they operate that will affect their ability to do their jobs? I came in being sure we need to be looking at the horizon, so also what do we have to think about, how do we raise issues now to help members address what’s coming down the pike. The PIE: Being prepared for anything to happen in the future seems more relevant now than ever before. You started at the same time as another well-known leader in the US. The PIE: So you had a head start. At the AIEA conference in February you spoke about international education being in the best of times and the worst of times. Everything is changing so quickly so I am wondering how you are feeling now. EB: The immediate issues change daily, weekly but the underlying issues don’t, have not. So the best of times part of it is still the case. International education is incredibly important. Since that speech in February, some people said foreigners won’t come to the United States but the opposite was true for NAFSA. We were thrilled that we had people from 107 countries here, that there was a significant interest in coming from around the United States but also internationally. I said then and I have said it subsequently, this is where we come to talk about it; how do we defend what we care about? We think international education is important and it should continue to be, and that is a strong bond between people around the world, and we should be a part of supporting it. And the members agreed, they are here supporting it. They want to be part of that solution. The PIE: You have taken a strong stance on political issues such as the executive orders on immigration and the appointment of Jeff Sessions for US Attorney General. Do you think educators should wade into political waters more? EB: I think it is important we express the values that this association cares about. We are founded on values and principles and we see how we interpret them every decade and in our current environment. We are not saying other associations necessarily have to do exactly what NAFSA does. We recognise we have the benefit of not taking public funds and therefore we are able to speak out on public policy and so we may be able to play a role as being a catalyst in the conversation, but we represent a wide range of associations and each will find its way to address its own issues. The PIE: If you could wave a magic wand over international education in the United States right now, what areas would you improve? EB: There are so many strengths! That is one of the reasons that people want to come to the United States, so I first of all want to preserve the rich diversity of institutions large and small, public, private and so forth. But I think one thing that NAFSA and the general country is thinking about is: how do we continue to increase access? Access to higher education is extremely important for the nation as a whole and individuals, and for our commitment to our democracy. We need to continue to look at how we make sure people across our country, irrespective of financial means, are able to flourish and to have the benefits of higher education. And we think of course international education is part of that and the ability to be part of a prepared workforce. Most issues have some sort of international component we want to be aware of, whatever that field is. The PIE: You have had such an impressive career. What has been your biggest achievement so far? EB: I must say I have been very fortunate. Many people, my family and friends have been very supportive. I was very lucky to have incredible education opportunities early in my life, and a wide variety of professional [opportunities]. There are various things that I think were particularly enriching; one was human rights issues in the context of international diplomacy, being a part of the United States’ return to the Human Rights Council. I gave the first US address to the Human Rights Council and was saying that the US could contribute to all aspects of global issues, peace and security and development and human rights. Ultimately, the reason we do politics and policy is because you care about creating an environment where humans can flourish. Human rights is a part of that, education is part of that. Early in my career I had the opportunity to be part of making the case of why the United States should return to being part of UNESCO, and I continue in that area as well. The PIE: Why did you choose to move into education? EB: In some ways, my career has always been about education. I have had the opportunity to be a faculty member at three different institutions, two in the United States and one in Europe, which was fantastic. When I was in the State Department it included working on international education issues in the multi-level context. So when I was on the policy and planning staff back for Secretary Albright from 1999 to 2001, then-director Mort Halperin said to each of us, “in addition to your day to day stuff you should pick a topic you should work on that you think is part of a longer term policy issue”. Mine was UNESCO. So I spent time looking at what would be the US’s reasons to re-join, why was being involved in the global debate on education important. My position with the Secretary of State was fantastic, but you spend a lot of time working on the crisis; a lot of your time on any given day was what was on the agenda of the Security Council. And they were always the worst, because they had been dealt with previously either locally or nationally, but those are the hardest issues. So you try to work hard on preventing the worst. At this stage of my career I would like to help promote the best and education is essential to that, so being part of international education is really exciting. The PIE: You talked about looking to the horizon and preparing educators for the future, but what is your long game as head of NAFSA? EB: There are several things – and I am still learning a lot. One of the fundamental areas that NAFSA serves its members in is professional training. So I want to look at how we can continue to provide the most useful training throughout their careers, because we all have turning points in our career. Even if they have been in the same institution, people take on different roles, so how do we help members make those transitions? Or there will be some new technology a few years from now – who knew X was important technology? !– so how to support adapting to new technology. Our students are changing. What’s a non-traditional student? Because all our students are non-traditional, some students who may be 18-22 and some students are at different stages of their life who are now involved with international education. And how do we, going back to access, make it possible for a student who is a parent too to also be part of international education? How do we make sure we are providing services to our members who are trying to help a wide range of students? We will continue to be active advocates, creating the environment in which international education can succeed. And then thinking about how the long-term changes in the profession might affect our members. If we think about mobility issues, more countries may be sending students, more Americans may be going to other places, other countries are developing their higher education systems and seeing them as an important part of their export market. The PIE: Everyone says you have this boundless energy and I’ve seen it this week but I am curious to know what music or artist really gets you up and dancing? EB: We did it to Cool and the Gang the other day! But I like a mix of things, everything from jazz through to Beyoncé. Very inspiring. I am being motivated.